Had a brilliant party at the InSpiral Lounge in Camden last Saturday night, as the final leg of Danielle's birthday weekend. When we arrived Ade Laugee (Planet Angel) was rocking the canalside cafe with funky goodtime breaks, the perfect warm-up for Dreadzone Sound System. He handed out this wicked little promo at the end. Dreadzone are one of my all time favourite bands and every time I see them turns out to be a special occasion. Greg Dread and MC Spee were on fine form as always, and had the whole of the tiny cafe bouncing to the ceiling with dubwise energy. It was so frantic that condensation was forming on the ceiling of the tiny cafe and dripping down onto the decks. I always forget how much fun Dreadzone are, and found myself dancing more than I have in ages. 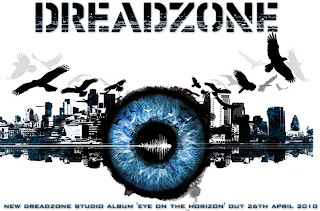 They finished with a new tune in an east end gansta ska style, from their new album Eye on the Horizon which is coming out on 24 April supported by a full live tour. Greg Dread told me after that on the DJ front he's been playing a lot of electro and dubstep lately - sounds like something I'd like to hear! Up after Dreadzone was my mate Ade (Om Bongo), invited to play one of his epic progressive techno sets. He really kept the engergy in the room going, despite the change in style and by the time I left was blasting out Dirty Loud to a busy room. I posted this wicked mix from Ade in December and he's just released a new mix, Revenge of the Techno Hippies on Soundcloud!